Have you noticed that top toques have adopted or been adopted by @SNCF (France’s national state-owned railway company)? 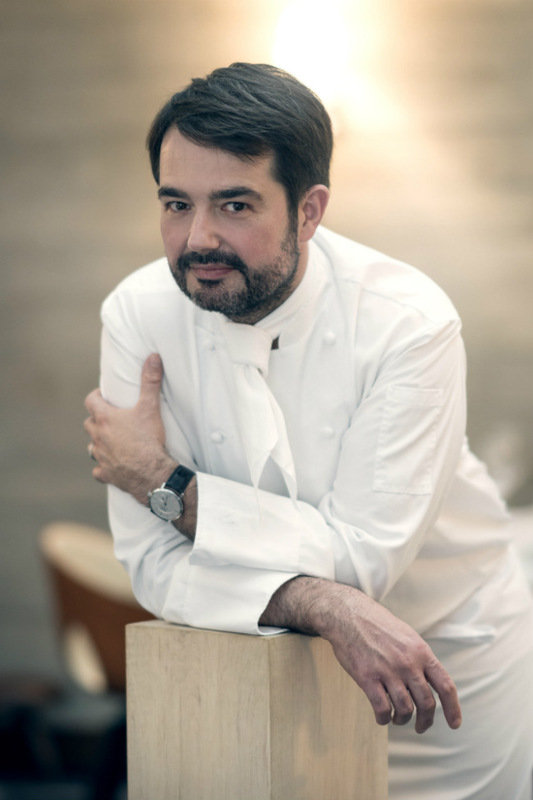 Eric Frechon at Gare Saint Lazare, Thierry Marx at Gare du Nord, Christian LeSquer coming soon to Rennes, Michel Roth in Metz, and Alain Ducasse at the Gare Montparnasse in 2019. 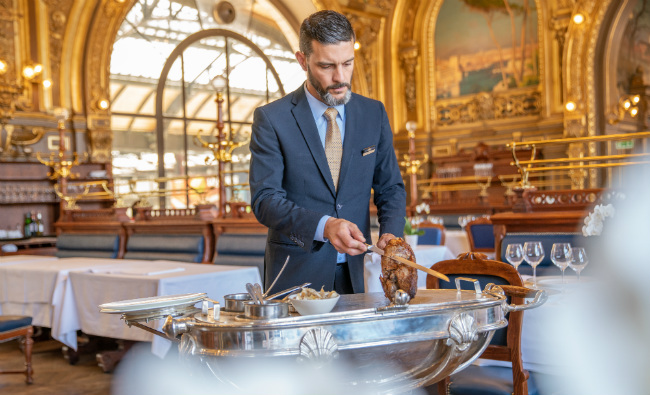 Recently Michel Rostang has refreshed the menu at arguably the most romantic of all the train station brasseries in the world, the Belle Epoque Le Train Bleu in the Gare de Lyon, showcasing Lyonnais and Mediterranean cuisine. Gare de Lyon was built for the Paris exhibition of 1900, along with the glass-domed Grand Palais and Petit Palais off the Champs-Élysées. 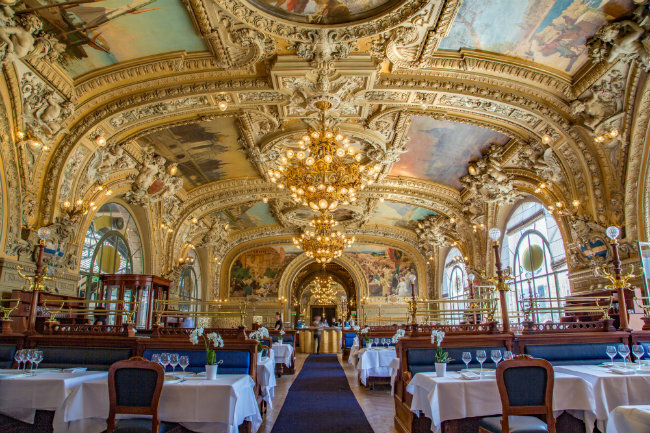 The Buffet de la Gare opened in 1901 and in 1963 became Le Train Bleu from the train that transported the rich, famous, you and I, to the Riviera. Hemingway, Dali, Brigitte Bardot, Jean Cocteau, Coco Chanel and Jean Gabin were regulars. Immortalized in many films such as the 1972 Travels with My Aunt, based on the Graham Greene novel – from the restroom spy on the departing trains! 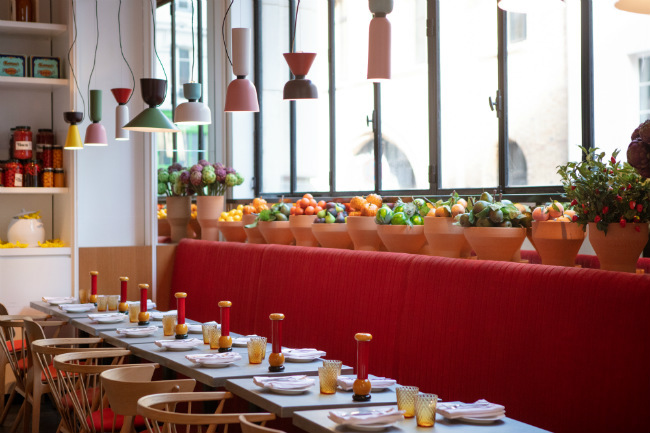 Le Menu du Voyageur (€49 + wine by the glass from €9-€21) can be served in 45 minutes. 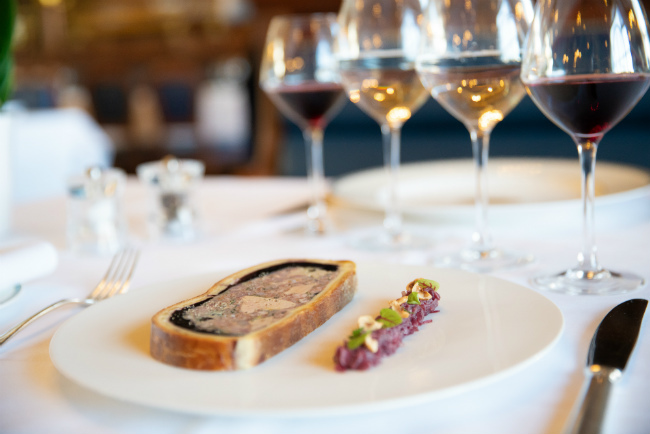 And, at lunch and dinner, Menu du Train Bleu is €110 with wine pairings. A La Carte about €69 + wine. We loved game and foie gras pâté en croute with fig chutney. House (lightly) smoked salmon, beetroot and granny Smith tartar with horseradish cream. And regal, regional, roast lamb carved at the table from the shiny silver Christofle trolley with Michel Rostang’s signature Gratin Dauphinoise. Fabulous desserts by Thierry Jolly – rum baba, house made citrus punch, Chantilly! 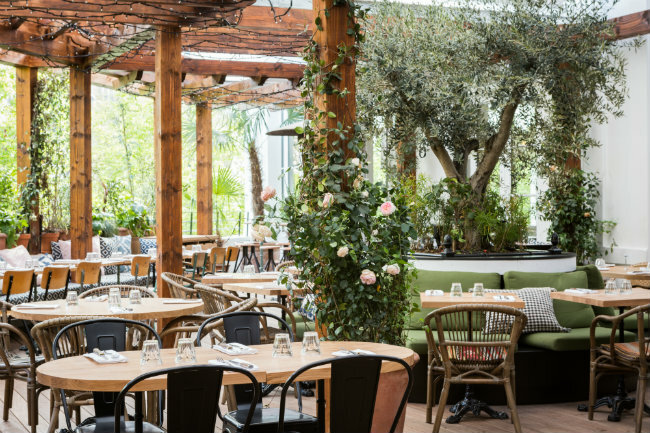 This chic bar-restaurant-terrace, located in the former Auteuil train station, is buzzing with “ze beautiful pipole” ordering Instagram-worthy pizzas and pastas, rum cocktail (and mocktails), while discussing their latest culinary journeys/the new Isabel Marant makeup (her)/ where to get the Porsche serviced (him). Average spend €44 + drinks. 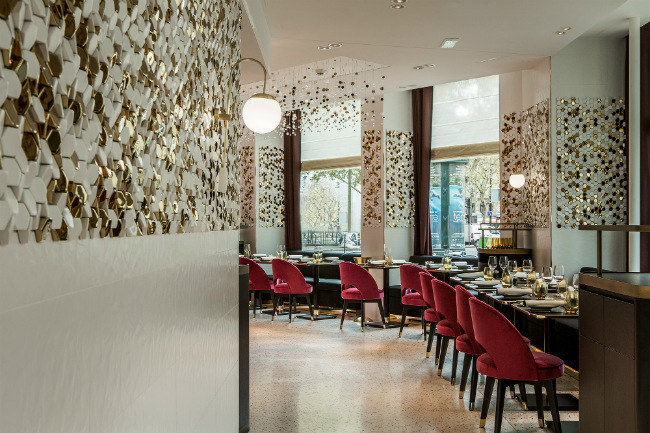 With sparkling design by Laura Gonzalez, the brasserie extends over several airy spaces – the bucolic penthouse snugly heated in winter. We loved Planche de 4 Pizzetas, truffled Burrata, Cæsar Salad d’Auteuil, Beef Tartare Profiteroles d’Auteuil, Café Gourmand and the “forget all your troubles, we’re here to party” atmosphere. 78 rue d’Autheuil, 16th. Metro: Porte d’Autheuil – Bus no. 52 stops right outside! Tel: +33 (0)1 40 71 11 90. Open 7/7 from 9am-2am. 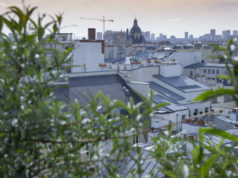 In a handsome Haussmannian mansion, opposite the neo-classical Church de la Madeleine (1842), Fauchon (on place Madeleine since 1886) recently launched the brand’s first “gourmet” hotel with a Carita spa. 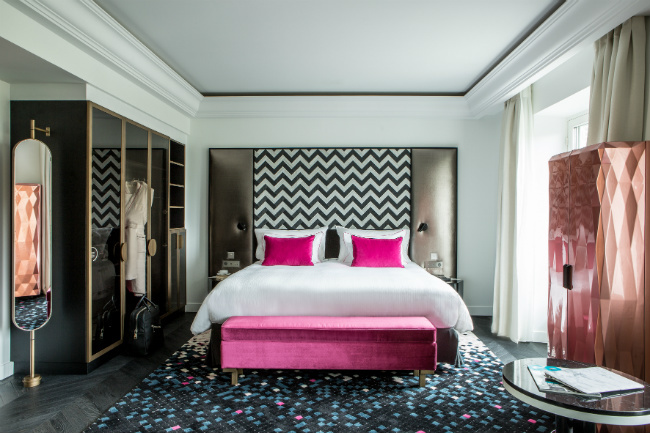 Following three years of digging and a hefty 35 – 40 M € of investment, there are 37 airy rooms and 17 suites designed by architect Richard Martinetin the signature Fauchon hot fuschia pink and black colors (from €650 – €3,000 per night). Note the unique in-room mini bars stocked with complimentary goodies and the availability of a private in-suite chef. Guests have a private dining room and the Jardin des Thés for breakfast, tea time etc. and the concierge will arrange, say, Private Shopping Experiences and Private Cruises. 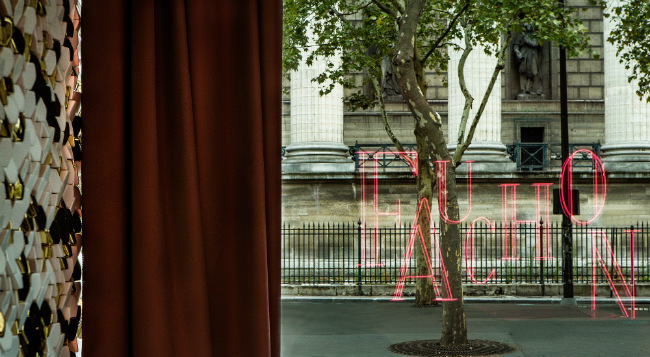 “We want to spoil our clients with luxury bespoke Paris experiences,” says Jérome Montantème, Fauchon’s genial General Manager, happy to take guests on his daily early morning run – Tuileries Gardens, anyone? Le Grand Café Fauchon is the main restaurant/terrace open from breakfast to dinner via an afterwork Glam’Hours for delicious food (organic tomatoes from La Bergerie de Rambouillet/Paté en croute Fauchon/Lemon meringue tart) and excellent French wines (Average €50 + wine). 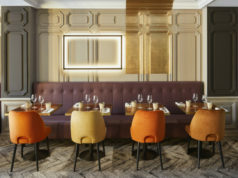 Recently opened in the Art-Deco listed Mutualité building, the Italian trattoria by Ducasse Restaurants with GL Events is designed by architect and urban planner Jean-Michel Wilmotte, with a little help from Fréderic Grasser-Hermé, Luca Nichetto and Pierre Tachon. What’s in the open cucina? 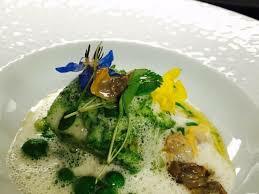 Simple dishes full of character, just like talented chef Matteo Lorenzini (formerly at Hotel de Paris, Monaco alongside Franck Cerutti). Pizzette (Margherita, what else! ), a selection of salumeria (coppa, tagliere di salumi), a wooden planche of charcuterie and cheese, antipasto (octopus potato, caponata, caprese). 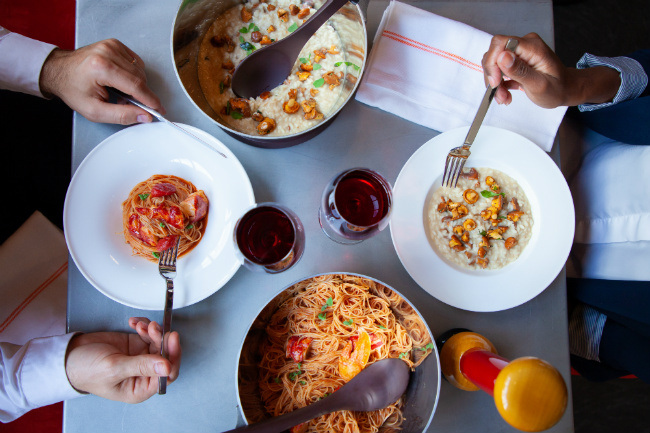 Mains of Escalope Milanese; risotto, girolles mushrooms; a comforting tangle of Bucatini pasta, pepper and grated cheese; Linguine alle vongole; Capellini all’aragosta (lobster); slow cooked manzo (beef cheeks) or oven baked orata (sea-bream) fennel and lemon confit. Stunning tableware and epic eating irons by Pininfarina pour Mepra. Desserts include grand Italian classics like Tiramisu, Zuppa Inglese, Panna Cotta and chocolate ice cream from Manufacture d’Alain Ducasse. Italian, French, Sicilian wines are by Alain Ducasse and Gérard Margéon, the charismatic “Mr Wine” of Ducasse’s 18 Michelin star eateries. 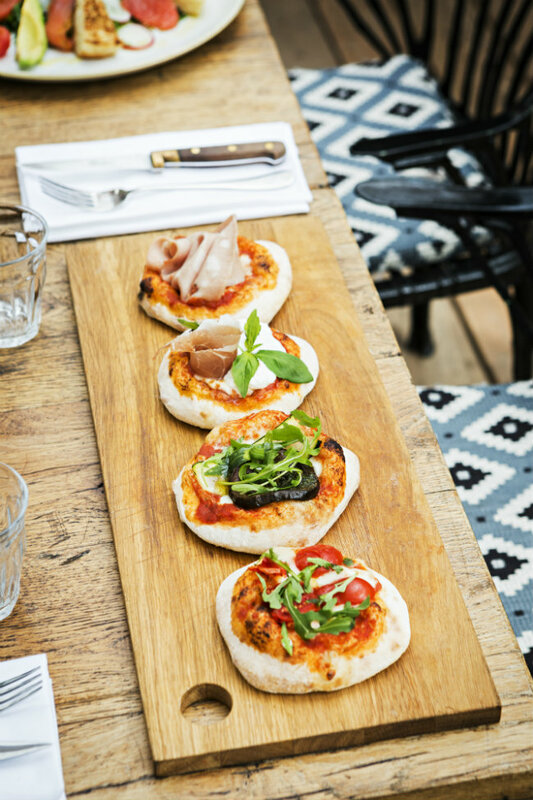 So, take a seat on the very soft velvet banquettes, or at the bar with its cute knitted charcuterie by Yuki & Daughters, prepare to make NBFs (new best friends), and taste some of the best Italian in town. The man from Martinique Jimmy Desrivières, formerly in the UK (so everyone speaks perfect English!) and at Georges Blanc, Vonnas, with Alain Reix at Le Jules Verne, Marc Marchand at Le Meurice, Vallon de Valrugues, Saint-Rémy-de-Provence, Helene Darroze, London and Paris etc. 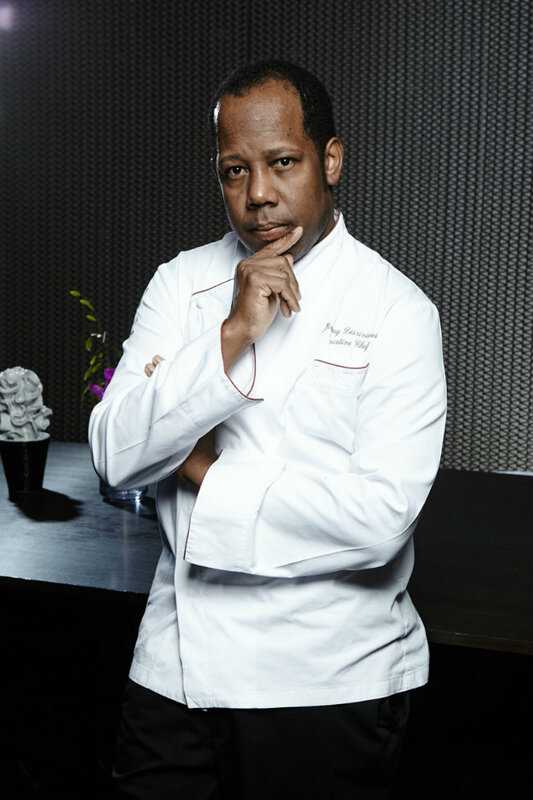 Jimmy orchestrates a mouthwatering alliance of light neo-classical cuisine with subtle exotic Caribbean perfumes and spices. Diver scallops, lemon and lime; marinated mackerel, Granny Smith, cucumber; Catch of the day, coco de Paimpol, piment d’Espelette, curcuma and coquillages jus; Old comté cheese, cumin ice cream and Chocolate pistachio croustillant. 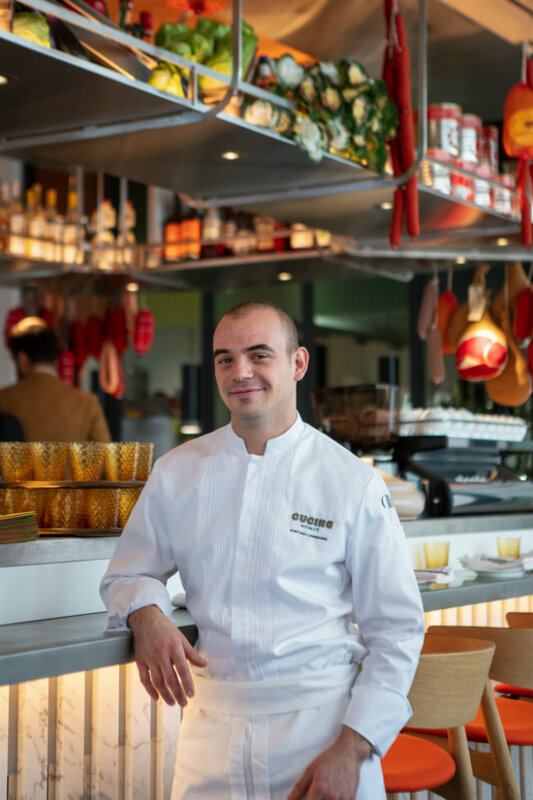 Figaroscope predicts a Michelin star in January! Lunch formula €29-€35. Dinner €45. A La Carte average €75 + wine by the glass from €5. Try the juicy Mâcon La Roche Vineuse 2015 Domaine Merlin €36. 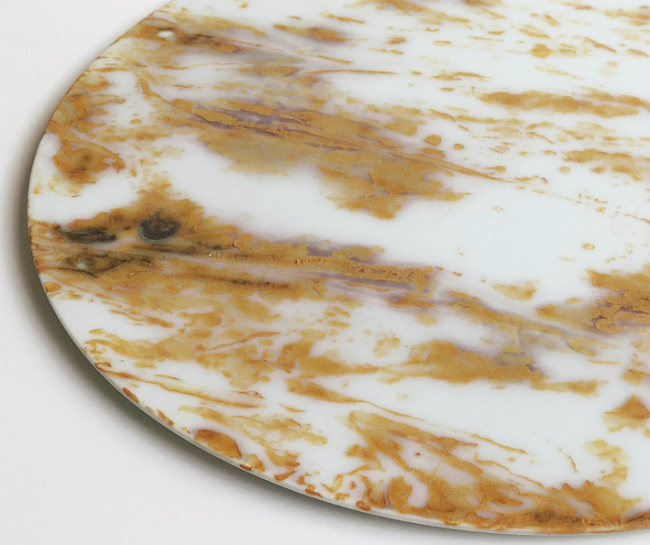 Jean-François Piège and Maison Kamachi, the 400 year old master porcelain makers, showcase an exclusive new collection of tableware which will be used for the chef’s grand menu “Mets Grands Vin” (705€ including wine) at Le Grand Restaurant from Monday 19th to Friday 23rd November. 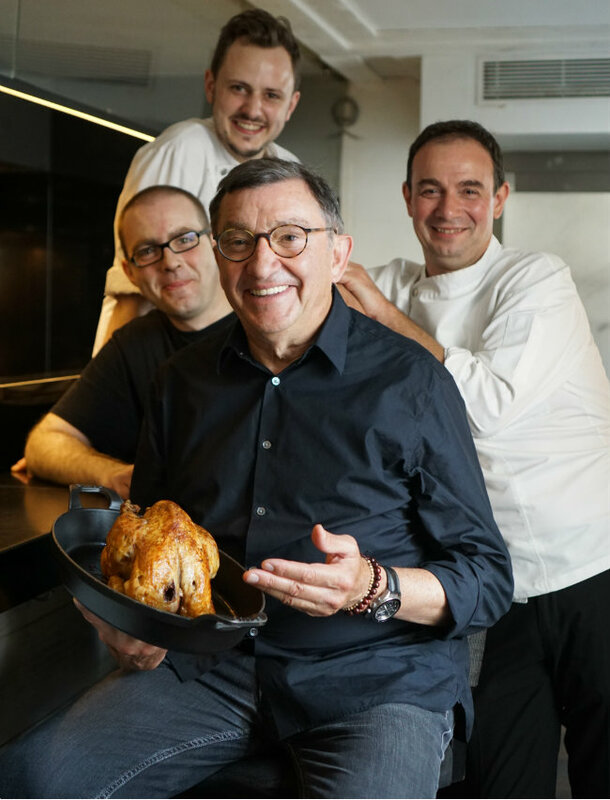 Chef Antoine Westermann launches end-of-year festivities on November 22 with his multi-course Thanksgiving menu at Le Coq Rico, Montmartre, starring plump, stuffed, roasted, Ardenne turkey with chestnut fricassée, red cabbage, sweet potatoes. €75 + wine. Yum! Tuesday, December 4, a hundred or chefs and their brigades organize 12 dinners in 12 French towns, including Paris. 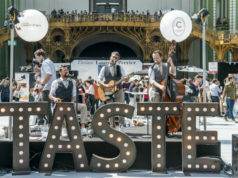 The proceeds of the dinners – €100 per person, including drinks – are donated to RDC – list of participating restaurants on www.lescollectionneurs.com. what I picked off the menu was itty bitty. I spent about 24 euro and that included dessert. Maybe I didn’t look at the right part of the menu. It was chicken, very small slice, about 2 tablespoons veg and about 2 tablespoons of some kind of potato. Very nice, but did I order from the wrong part of the menu? I could have eaten more.